Port Everglades is the first seaport in the United States to voluntarily enter a partnership agreement with the U.S. Environmental Protection Agency (EPA) to study air emissions in a seaport scenario.Through this partnership, the EPA and Port Everglades agreed to work together to develop baseline and future year emission inventories and to evaluate various effective technology and operational strategies. harbor vessels, cargo handling equipment, on-road vehicles, and rail operations. 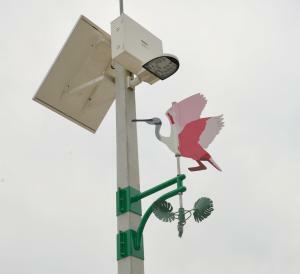 Photo Caption: Artwork of a Florida native flamingo serves a dual purpose powering lighting through wind while livening up the Cruise Terminal 4 parking lot. The Port Tariff, the rule book that guides all vessel operations at the Port, prohibits certain ship activities that discharge pollutants into the air. For example, shipboard incineration is forbidden while ships are in port.